The woman is the centerpiece of Humana activity, both in the development of cooperation programs in the South and in the management of the Foundation in Spain. The Foundation is actively involved in various events taking place this week to mark the International Women's Day, celebrated every March 8. In San Agustin de Guadalix (Madrid) Humana works with the activities under 'Many faces of women, many stories', organized by the Department of Women. On Tuesday, March 5, the Foundation offers the workshop 'African women', whereas until March,10 promotes the Culture House photo exhibition 'Women in action. The role of women in development '. In addition, throughout the week will hold a special campaign textile collection, involving several schools, the Women's House and the House of Culture. 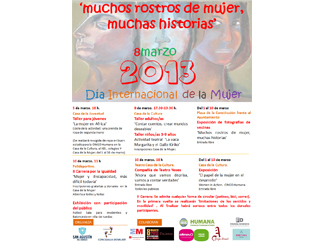 Starting Wednesday, March 6, the exhibition 'Women in Action' will be open also the Madrid municipality of El Boalo. From March 11, this exhibition will be on Lozoyuela and Ajalvir, in the Community of Madrid. Gender equality implies a society in which women and men have the same opportunities, rights and obligations in all areas of life. 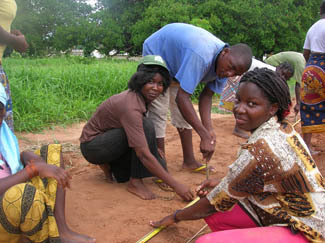 Central to the promotion of gender equality is the empowerment of women, especially in regard to the identification and correction of imbalances of power, giving women more autonomy to manage their own lives and, while sensitizing men about the value of this process, since it is vital for sustainable development and human rights. 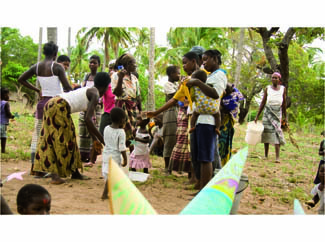 Humana People to People works to address these challenges in each of its 475 programs of development cooperation. As a result of these projects, girls, boys, women and men are acquiring the knowledge, skills, confidence and support to create better opportunities for all, fighting poverty together with their families.